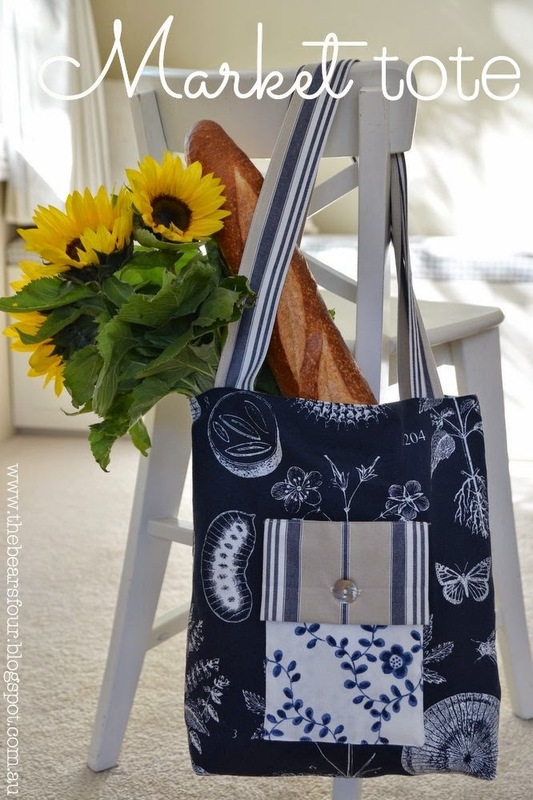 Why not surprise mum this Mother's Day with fresh bread, fruit and flowers from the local farmers market in her very own market tote bag that you've made her! You can even make her brunch from your selection of market goodies. Step 4: With right sides together (RST) pin the outer pocket pieces together and sew around 3 sides, leave one short side not sewn. Step 5: Turn right side out and press. Tuck in the seam that was left open and press. Step 6: Place pocket on main bag fabric piece in a position you like with the open side seam on the bottom so when you sew the pocket onto the bag fabric piece, you close up the seam. Step 7: Sew the pocket on. Sew around three sides, leaving the top side open. Step 8: Fold pocket top in half RST and sew around the 2 short sides, leaving 1 long side open for turning right sides out (RSO). Step 9: Turn pocket top RSO and press with open seam pressed closed. 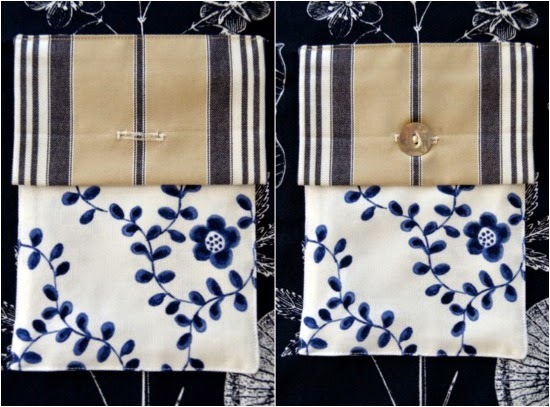 Pin pocket top to the main bag fabric piece above the pocket and sew along the top. Step 10: Sew button hole and button on. Step 11: Pin main bag fabric pieces RST and sew around 3 sides, leaving the top not sewn. Step 12: Pinch the bottom corners of the bag together and press. Sew 1 inch in from each corner. Step 13: Now it's time to work on the inner (lining) bag. 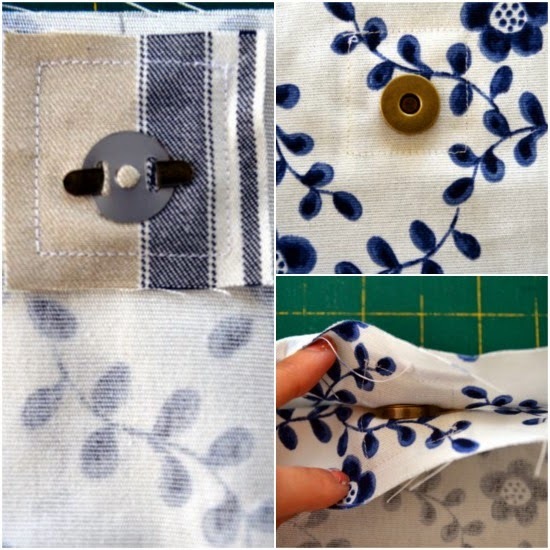 Pin the inner pocket fabric RST and sew along 3 sides. Step 14: Turn RSO and press open side closed. 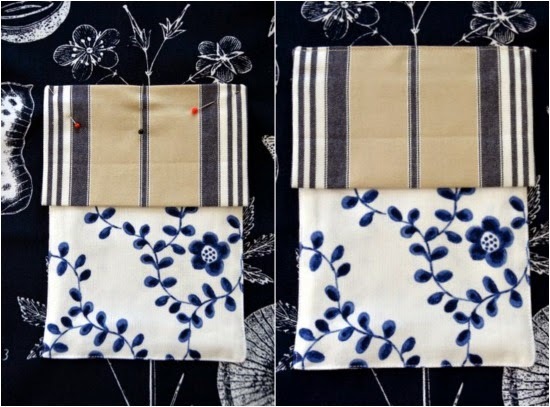 Position and pin the pocket piece onto one of the inner (lining) bag fabric pieces. Step 15: Sew along the inner pocket short sides and bottom long side, leaving the upper long side open. Step 16: Measure 3.5 inches in from the left side of the pocket and sew a vertical line down the pocket to form a smaller pocket for a phone. Step 17: With inner (lining) fabric pieces RST, sew along the three sides leaving the top open, as you did with the outer bag. Step 18: Press down the corners and sew 1 inch in from the corners as you did for the outer bag. Step 19: Pin and sew a 2 x 2 inch square reinforcement piece of fabric to the middle top of each side of the inner (lining) bag. Step 20: Attach the magnetic closures. Step 21: Now to sew the straps, fold each strap piece in half lengthways and sew RST. Step 23: Press straps with seams down the middle of one side. Sew along each side of the straps. Step 24: Place bags one inside the other, RST. Position the straps with the ends sticking out of the top of the bags. Sew along the top edge of the bags, leaving a small opening to turn the bags RSO. Step 25: Turn the bags RSO and press. Press and pin the small opening closed that you left open to turn the bags RSO and sew around the top edge of the bag to close up the opening. It's now ready for filling!